As your students will no doubt discover in their research, piezoelectricity is a two-way effect: physical motion from electricity and visa-versa. It will be clear how well they did their research by the types of applications they think of for the ëlectricity-to-motion" form of piezoelectricity, given the typical physical scale of piezoelectric displacements. Electrical resistance is analogous to mechanical friction: electrons cannot freely flow through a resistance, and the "friction" they encounter translates some of their energy into heat, just as the friction in a worn mechanical bearing translates some of the kinetic energy of it's rotation into heat, or the friction between a person's hands while rubbing them together on a cold day translates some of the motion into heat. How long will it take for the light bulb to receive electrical power once the battery is connected to the rest of the circuit? Approximately 11 milliseconds (0.0107 seconds). Electricity is fast: the effects of electron motion travel at approximately the speed of light (186,000 miles per second). Actual average electron velocity, on the other hand, is very, very slow. A convenient analogy I've used to illustrate how electrons may move slowly yet have rapid effect is that of a closed-loop hydraulic system. When the valve is opened, fluid motion throughout the system is immediate (actually, the motion progresses at the speed of sound through the fluid - very fast! ), yet the actual velocity of fluid motion is much slower. Incidentally, the double-chevron symbols indicate an electrical connector pair (plug and jack; male and female). Calculate the average velocity of electrons through this wire. Average electron velocity = 0.000647 feet per second, or 6.47 ×10-4 ft/s. This is very slow: only 0.00777 inches per second, or 0.197 millimeters per second! Despite the rapid progression of the effects of electron motion throughout a circuit (i.e. approximately the speed of light), the actual electron velocity is extremely slow by comparison. Number of free electrons per cubic meter of metal (an example taken from Encyclopedia Brittanica 15th edition, 1983, volume 6, page 551) = 1029 electrons per m3. The metal type was not specified. 22 gauge wire has a diameter of 0.025 inches. It is also very helpful to have knowledgeable students demonstrate their solution techniques in front of the class so that others may learn novel methods of problem-solving. In the late 1700's, an Italian professor of anatomy, Luigi Galvani, discovered that the leg muscles of a recently deceased frog could be made to twitch when subjected to an electric current. What phenomenon is suggested by Galvani's discovery? In other words, what does this tell us about the operation of muscle fibers in living creatures? More importantly, what practical importance does this have for people working near electric circuits? Essentially, muscle fibers are äctivated" by electrical signals. I'll let you figure out what practical importance this effect has for you! Paramedics and other emergency medical personnel sometimes use a machine called a defibrillator to re-start the regular heart-beat of a person whose heart has stopped or is spastically convulsing (fibrillating). Explain what this machine does to "restart" a person's heart. A defibrillator machine sends a powerful surge of electric current through the victim's chest to force his or her heart muscles to contract. Follow-up question: explain how this principle is similar to that of an electric stun-gun ("TASER") or other high-voltage, non-lethal weapon to immobilize a person. How does a defibrillator's function differ from that of a stun-gun? This question is intended to start a lively and active discussion on the effects of electric current on human muscle and nerve tissue. Students are likely to come up with all sorts of interesting questions about defibrillators and stun-guns, so be sure to do your own research in preparation for posing this question to them? The choice of battery "polarity" in a simple light bulb circuit makes no difference at all. In either case, the light bulb will energize when the switch is closed. It should be noted that not all electrical loads are "non-polarized" like an incandescent light bulb. Some electrical components, such as light-emitting diodes, are polarity sensitive, and will function only if current goes through them in the proper direction. What physical effects of electricity are manifest in a lightning strike? Heat, light, sound, magnetism (compass needles deflecting), radio (ßtatic" heard on AM radios), and chemical reactions (fixation of nitrogen, and the production of ozone). Lightning is a universally recognized phenomenon, and one that inspires no small amount of awe. In other words, it is a perfect discussion topic in a science-oriented class! There is much to be learned about lightning from a variety of sources, and it serves as a vivid illustration of electricity's varied effects. Having discussed several effects of electricity manifest in lightning strikes, it is an interesting class exercise to discuss possible applications of these effects. What can we do with such phenomenon? Knowing that electricity has the ability to produce heat, light, sound, magnetism, electromagnetic waves, and chemical reactions, what interesting and useful things may we employ electricity for? 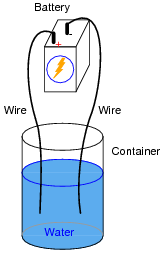 If the terminals of a DC voltage source are connected to individual wires, dipped in a container full of water, an interesting effect takes place on the submerged surfaces of the wires. What is this phenomenon, and what is it called? I'll let you discover the actual phenomenon on your own (be careful to use no more than 12 volts when performing an experiment like this, for safety! ), but its name is electrolysis. Electrochemical effects are very commonly used in industry to form chemical substances. Ironically, the battery itself shown in the illustration, is another example of electrochemistry in action, just hidden from sight! 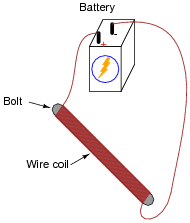 What effect takes place when an electric current passes through a coil of wire, wrapped around an iron object such as a large-diameter bolt? Hint: place some small paperclips or other lightweight steel objects near the end of the bolt when energizing the coil. What is this phenomenon called? The phenomenon is known as electromagnetism. This makes an excellent classroom demonstration, and students should immediately recognize some of the practical applications of this phenomenon. What phenomenon is exhibited by the phototube in its function? What possible applications of this effect can you think of? This phenomenon is called the photoelectric effect. Incidentally, the mathematical expression of this effect earned Albert Einstein a Nobel Prize for Physics in the year 1921. Applications of the photoelectric effect are many and varied. Special versions of the basic phototube (called photomultiplier tubes) are able to detect extremely small impulses of light, enabling scientists to detect small light flashes from cosmic-ray events, among other optical phenomena.